Travelling is one of the many delights that is getting increasingly easier due to the access we have to the world around us as well as changes in the prices of flights and accommodation, which is fluctuating but also getting cheaper. There is however the issue of comfort, which can be difficult to attain when you’re on the move. The use of a travel pillow can help to bring back the comforts of home whilst also giving you a proper place to rest your head when you’re in a difficult and uncomfortable position. They can be a real lifesaver for long plane flights or long bus trips and might just keep you sane for those few hours until you make it to your destination. Despite the name pillow there are different looks, feels and designs for the travel pillows that are available, making it a real challenge to find the right one. However with the right insight, you can get the best travel pillow for you as well as the most comfortable, ensuring that your trip is spent enjoying the sites and not in pain. What should I look for in a Travel Pillow? First and foremost is the design of the travel pillow. It’s not necessarily the same as the regular pillow you have in your home but you are attempting to find one that emulates it as closely as possible. Emulating the overall feature of a home pillow helps o make the travel pillow much better and achieve what you want it to whilst on the move. 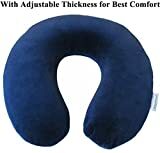 You can opt to purchase a smaller sized pillow as your travel pillow, however most these days focus on neck support. This is mainly because they are used in conjunction with the wearer being in a seated position and not having the ability to lie down. It should support your neck whilst also providing comfort whilst you are seated. 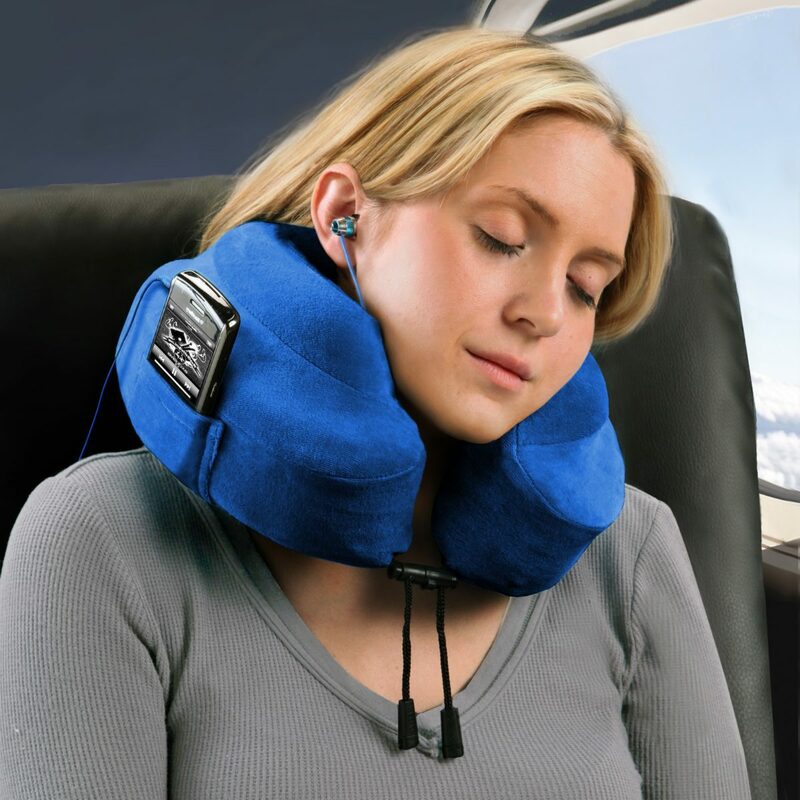 There are varying designs in the neck support that is offered by the travel pillow that can increase or decrease depending on what you’re looking for. 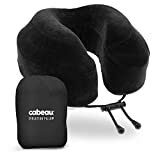 You can decide to get a smaller sized travel pillow that has limited neck support or one that reaches up to your jawline as well as down to your collarbone; however both have their own benefits. Portability is another factor to consider, as this item will come with you when you move around. A large pillow is not as easy to carry with you, particularly on flights or buses where the seating arrangement is smaller and not designed for the large sized pillows that you would find on your own bed. Additionally you will need to have one that is big enough to provide comfort as listed previously as well as one that can be decreased in size so that it can fit in your bag when you’re not using it. You should remember that the pillow will not always be out and around your neck and sometimes will need to be stored so you can easily carry it. What are some good quality travel pillows? The Best Pillow For Travel: unlike anything on the market, this patented, newly released and improved version has a built-in removable insert so you can adjust the thickness of the pillow based on your personal preference and sitting positions, preventing your head from being pushed forward. You now can sleep soundly even if you are sitting up on an airline seat with the help of this pillow! U.S. Patented. Zippered, machine-washable plush velour cover (Color: Dark Blue). Please note, we have never offered free or discounted products in exchange for an "honest and unbiased" review. Created with head and neck alignment in mind, this high quality, thermo-sensitive memory foam provides comfort as well as affordability to the mix. It is designed to mold around your neck and is zippered and machine washable. It can also be compressed to allow for easy storage and portability. 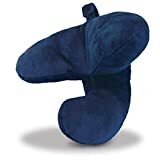 Designed uniquely and winner of many awards for its versatility and innovation, this travel pillow has a different design to allow for you to rest your head with a tilt to the side that prevents your neck from bending too much. It’s been advertised as excellent for travel, comfortable and also easy to store and carry with you. Please search "Evolution S3" for our significantly improved and newest pillow. PROVEN BY SCIENCE to be the most comfortable travel pillow. Designed to cushion vital points in the head and neck with high-grade memory foam. TRAVEL IN COMFORT and sleep in any seat or position. Front clasps and a unique design cradle your head and neck in any position for 360 degree comfort. This travel pillows is capable of compressing into your travel bag at ¼ of its original size. Additionally it offers memory foam to help shape itself around your neck and provide optimum comfort, is washable, has raised sides to give head and chin support whilst also including support for your music player whilst you rest. Key Takeaway: There are varieties of travel pillows that you may want to purchase, each with their own unique features and designs. There are enough that picking a suitable design should not be too difficult, therefore making the process of finding the right one for you to be a much easier and more enjoyable experience. It’s best to give them all special consideration and to try and find a location that has them so you can test them out in person yourself. Because of the different designs they may feel different than they look. With regards to pillows it is important to ensure that it is comfortable and offers proper support so you can depend on it when needed.